Grayson County Rails (that aren’t Denison. Denison deserves a separate post). Note that the map’s cardinal directions are a bit different. From left to right is north to south. To see a larger image of this map, click here. 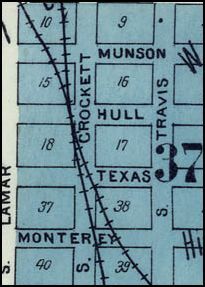 According to this map filed by the Houston & Texas Railroad with the Texas General Land Office, their rail line was proposed to extend to the Red River in 1872. Their terminus would be an apparently large town called Red River City, which, according to the map, was even bigger than Denison (the city that the MKT built). Alas, Red River City never became Houston & Texas Central’s terminus. Prior to the railroads, Red River City was a place to buy liquor after crossing the river on Colbert’s ferry (and was referred to Shawnee Town on land maps). When the H&TC finally came into Grayson County in 1873 (not 1872 as this map suggests), the line stopped in Denison to meet up with the MKT. Red River City is no more, and never much was. Here’s the view from the north end of Sherman (Grayson County, Texas) along the Houston, Texas & Central Railway tracks towards Tower 16 and the Union Depot, which was razed before 1950. 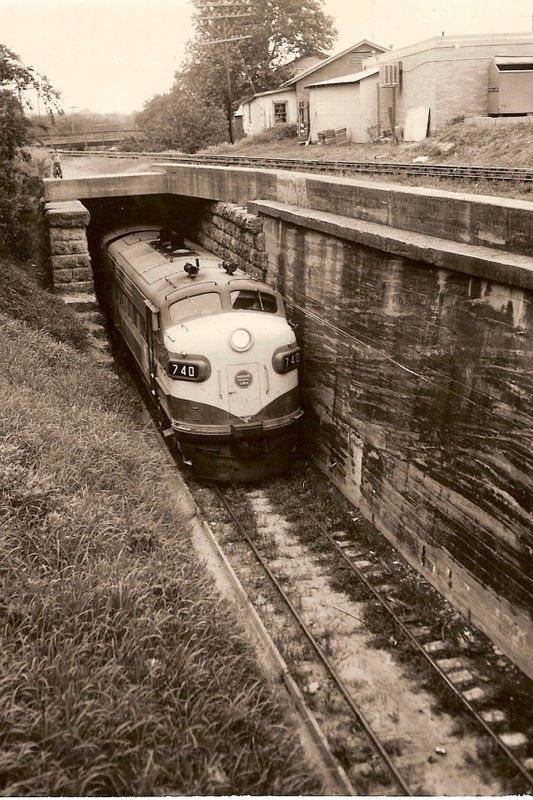 (City of Sherman, via Railspot – Hogan). Today, the location of the depot and the tower are obliterated by trees (and abandoned cars) (Sherman, Grayson County Texas). Van Alstyne (Grayson County, Texas) has kept its small-town charm, even though it’s right at the cusp of the ever-reaching Dallas/Ft Worth Metroplex. 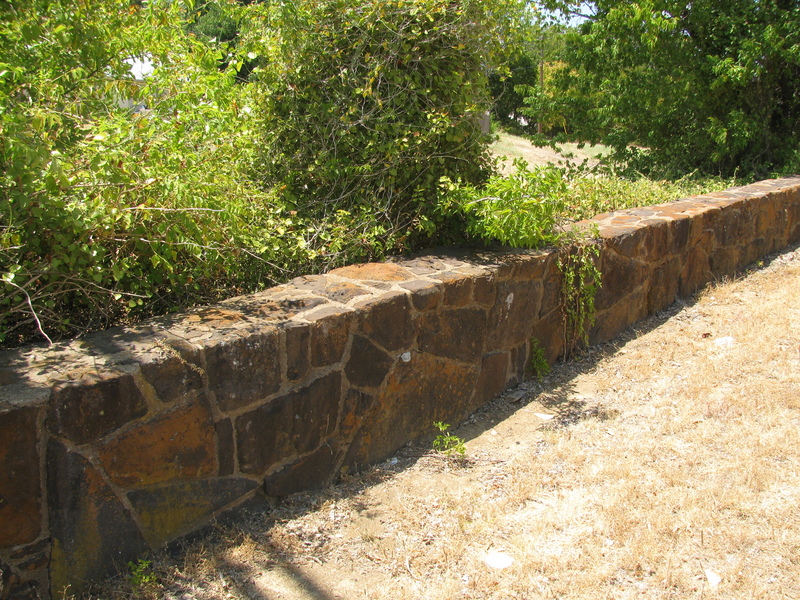 The tracks for the Texas Traction Company railway still adorn Preston Street. Texas Traction Company, ca. 1914, Van Alstyne Public Library. The power substation and passenger waiting room for the street car line used to be at the corner of Marshall and Preston streets. The building has been replaced by a nondescript, white, metal building (left edge of photo). 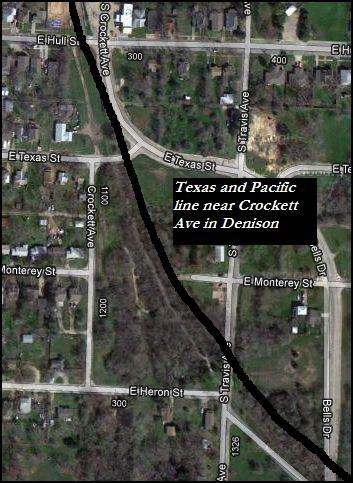 The Texas Traction Company line reached from Dallas to Sherman to Denison. Destroyed Texas Electric (once, the Texas Traction Company) streetcar being towed through downtown Sherman ca. 1946 (Denver Public Library). Speaking of the Texas Electric (formerly Texas Traction Company) and Sherman… in the 1940s, a crash along the route destroyed one of the cars. One of my hobbies is to find old location via Google Maps, and I did that (instead of grading, ha ha). Travis Street in Sherman hasn’t changed much, except that the TE tracks are no longer there. Along a county road in Jackson County, Oklahoma, lies the lonesome grave of Joel Moseley, 1846-1890. Mr. Moseley was born in Georgia and, at one point, made his way to Texas. He died when Jackson County (organized in 1907) was still part of Greer County, Texas until the U.S. Supreme Court decided that the land between the North Fork and the Prairie Dog Fork of the Red River belonged to Oklahoma Territory. Mr. Moseley may have died on a cattle drive (if it was a long distance cattle drive, it would have been the Great Western or Dodge City trail). He was buried along the trail, as the nearest cemetery was ten miles away. Locals knew about the grave, which was ringed with native stones and featured the granite headstone placed by his daughter, a Texas school teacher. They became concerned when the land surrounding it began to erode, so the county commissioner and his crew encased Mr. Moseley’s resting place in concrete along a culvert to keep him where he belongs. I stumbled upon the grave when I was driving out to the old Aaron school, and found the information above from Find a Grave. The Aaron school in Jackson County, Oklahoma (near Altus). The prairie is full of surprises. When you take into the account the vast volumes of literature that American historians have produced over the last two centuries, what becomes clear is that the Red River hasn’t been discussed much. Like the Thames in England, the Nile in Egypt, the Ganges of India, and the Tigris in ancient Persia, rivers have defined the civilizations that grew around them, and the Mississippi River has been given that honor in the United States. And that’s pretty much how it should be… the Red River isn’t the grandest of streams, after all. 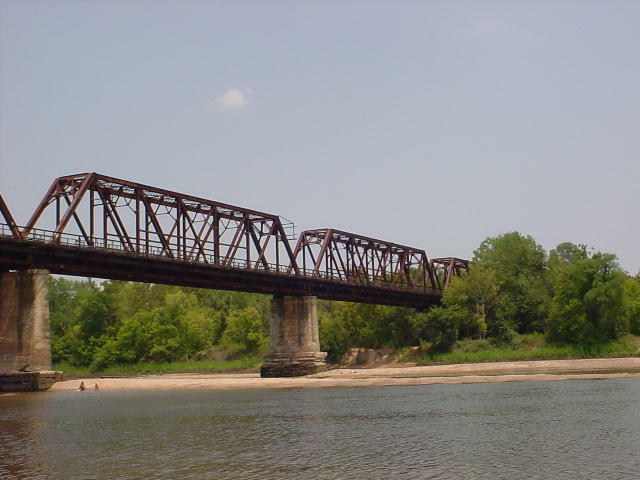 Though it figured prominently in the boundary questions between the US, Spain, France, the Caddoan Confederacy, Mexico, Texas, and Arkansas, the Red River happened to become important just as river traffic was slowly giving way to the railroads, and what could have become a major river in American history was instead left to nature. Certain historians have recognized the Red River, however, and none has done such a good job of it than Dan Flores. Flores, who holds a PhD from Texas A&M and is a native of Natchitoches, has become one of the eminent historians of American West history. His research has focused on the “Old Southwest” (also called the Near Southwest) in many of his books, and what I like best about him is that he emphasizes the past through both geography and art, which allows the reader to obtain a “sense of place.” One of his first projects was as editor to the short but informative Journal of an Indian Trader: Anthony Glass and the Texas Trading Frontier, 1790-1810 (1985). Flores allows Glass to recount his explorations, adding geographic descriptions to create a valuable reference to early interactions between Native Americans and European capitalists. 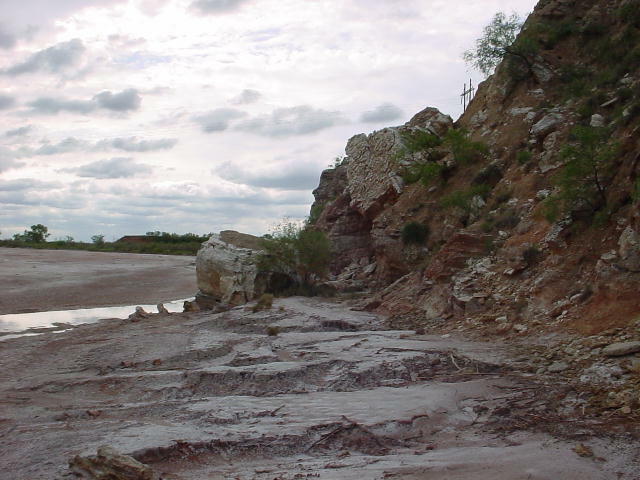 In Horizontal Yellow: Nature and History in the Near Southwest (1999), he again combined geography and history by explaining – very poetically – how the landscape of the Llano Estacado shaped human interaction. He was one of the first historians to offer a thorough treatment of the Louisiana Purchase expedition up the Red River in Southern Counterpart to Lewis and Clark: The Freeman and Custis Expedition of 1806 (2002). As best he could, he recreated portions of the journey himself, and filled gaps with a realistic imagination as so much of the original landscape had been altered over the years. I highly recommend Dr. Flores’ studies on the Red River. Like John Graves did in his classic treatment of the wild Brazos of 1960, Goodbye to a River, Flores makes the Red River a central figure in his histories, and when you read his books, the river becomes as important a figure as any one man or woman. I truly hope that one day, my small contribution to the study of the Red River will be even a fraction as good as his. Google Maps have been my constant companion since they were introduced back in the stone ages (okay, a few years ago). I can’t believe I ever did research without them, and I seriously pity the historians who came before me who didn’t have this kind of tool at their disposal. I should mention that I’ve been a map fiend from way back, and have always used them extensively… but! The satellite pictures on Google Maps (and Google Earth) truly help me understand the geographical context of what I’m researching. A snapshot of Spanish Bluff, the place where the Custis/Freeman Expedition was halted by Spanish troops in the early part of the 19th century. History cannot exist without a grasp of the geography where events took place. The location, time, and space are all important factors in understanding why and how things happened. Sometimes, it’s not the easiest thing to picture… landscapes change, after all. 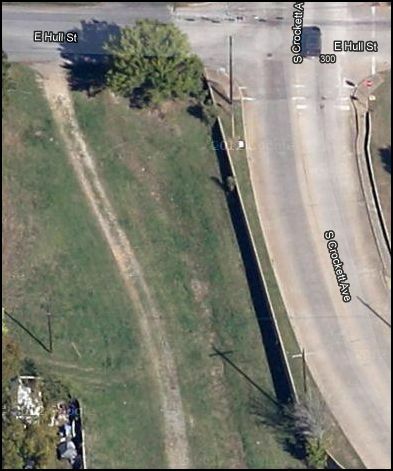 Using descriptions from the T&P site (behind Crockett and Hull Streets) and discerning the railroad bed from up in the air, I found the disused right-of-way on Google Maps. I made sure it was the right one when I traced it back to Bells. Looking at the photograph and the current condition of where the railroad used to be gives me a sense of how much Denison has changed over the years. 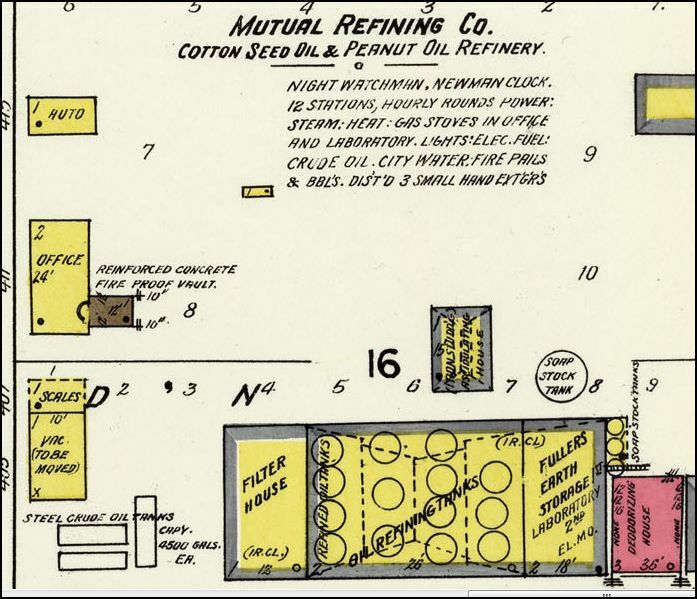 So, the bases I’m seeing are peanut and cotton oil tanks. Not earth-shattering, but at least I know what I’m looking at when I check out the ruins. Another way to do this is to check city directories from the time periods, but since I don’t have them handy, I’ll use the maps to figure things out. This kind of research is what goes on all the time inside museums, archives, libraries, bored people’s laptops at Starbucks, etc. Hey, it’s something to do!